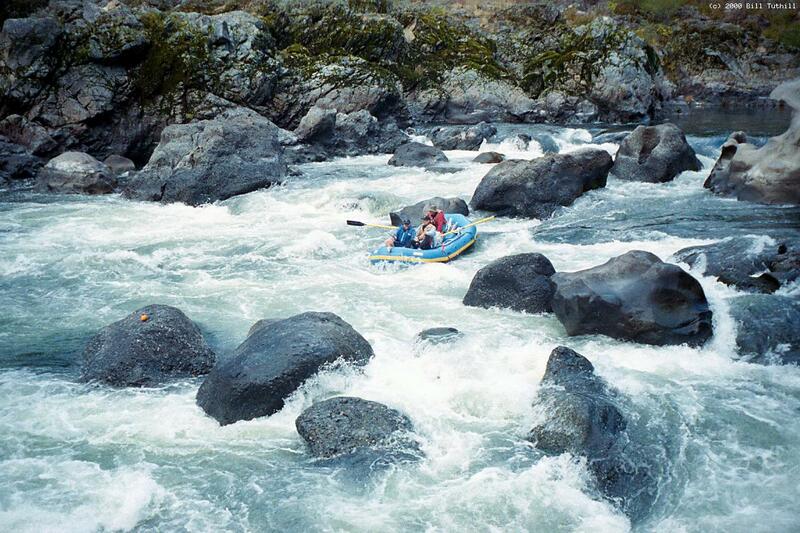 This is one of the finest whitewater runs in this guidebook, and perhaps one of the finest in the world. Scenery is excellent, whitewater is consistent throughout the run, fishing is good, wildlife is abundant, and camping is superb if somewhat crowded at times. The water is relatively clear and unpolluted, and becomes quite warm in late summertime. This is also one of the best multiday rafting trips in the western US. 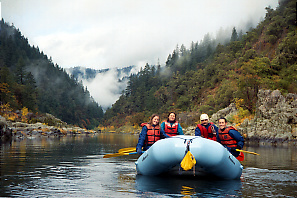 Interested people without rafting equipment can hire a commercial outfitter. 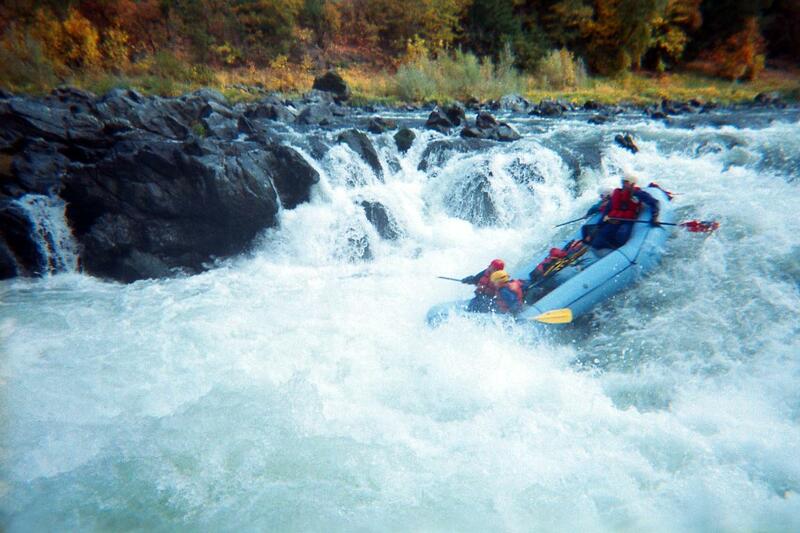 No whitewater experience is necessary when you go with a guide. 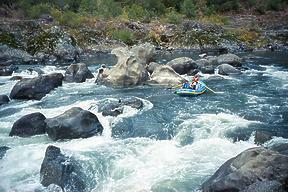 Unlike many other rivers, the Rogue is runnable all year long. The Rogue is unusual in having many wilderness lodges along the way. You could boat four days and stay three nights, evenly spaced. 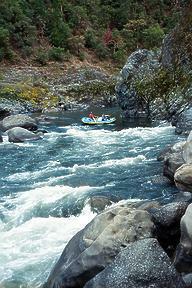 Or at high flows you could boat the upper rapids quickly and stay one night along the lower river, with its wide variety of lodges. 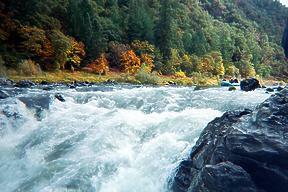 Reservations are difficult to come by in autumn, the busy steelhead fishing season. Black Bar lodge closes in December when its access road gets snowed-in. 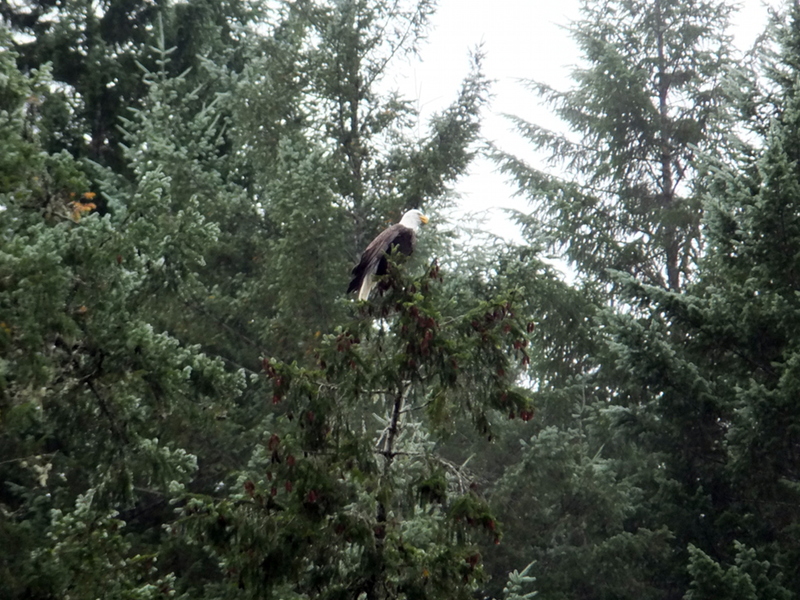 Most commercial outfitters offer lodge trips, so check with them if you're interested. Boaters can run the Rogue any day of the year, although in midwinter it sometimes snows at river level. The river corridor is absolutely beautiful in rainy weather, with clouds caressing the hills, although you might not enjoy camping in such conditions. So see the notes above concerning wilderness lodges. Camping in the rain really isn't so bad if you carry a large kitchen tarp. Short break in the weather on a rainy day. Private-boater permits are issued by lottery, with applications due in January. Tuesday departures are said to be the least sought-after. The busy season is, of course, Memorial Day to Labor Day when school is out. Lottery winners must confirm with $10 per person payment 10 days in advance, otherwise their permit is canceled. You can check cancellations on the BLM website, usually updated weekday evenings only. You may call the visitor center 541-479-3735 to claim a canceled spot, although the phone line is usually busy, 8 AM to 3 PM. Rain is common in the spring and even in June. 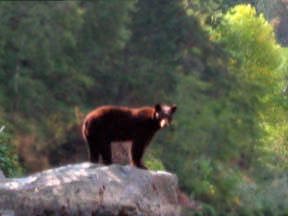 Fair weather often persists into September. Check weather forecasts before departure, and adjust your river schedule accordingly. In the mile-by-mile writeup below, campsites with toilets are listed. There are many fine campsites, even some large campsites, where people seldom stay due to lack of pit toilet. If you use your port-a-potty (carrying it is a permit requirement) you will have an amazing selection of camps. Foster Bar take-out has a convenient wash-out facility. The Grave Creek boat ramp can be crowded in mid-morning. Almeda Bar, 3 miles upstream, makes a good alternate put-in, and provides some class II+ warmup. Grave Creek rapid, class III. Big waves with a right bend and rock outcropping on the bottom left. Grave Creek falls, class III. A vertical drop of 3-5 feet, usually with tongue just left of center. Sanderson's Island where most of the water goes left. Rainie Falls campsite on the right bank. 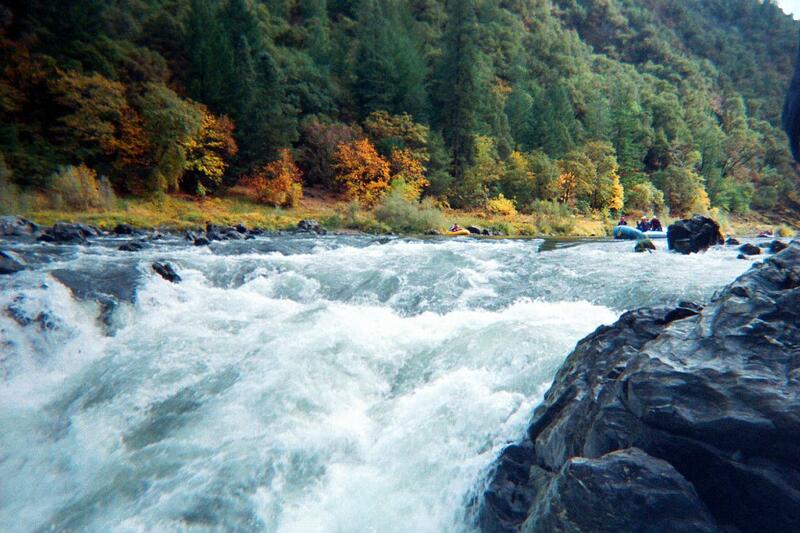 Recognition: in a straight calm section, the river spreads out and you hear a roar ahead. There is a sandy beach on the left above the falls, if you want to drop off passengers or scout the class V falls or class IV chute. 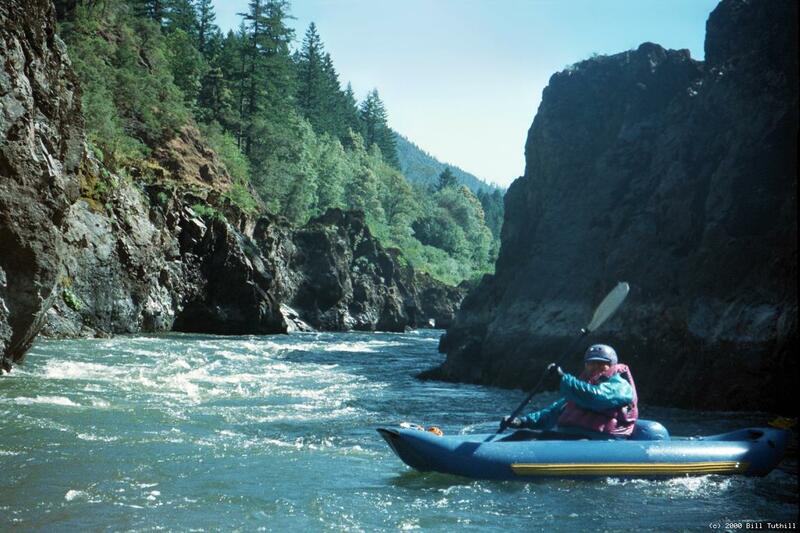 To run the easiest route, the fishladder, move or ferry to the extreme right side, pass in front of some rocks, and bump down the shallow chute. Most fish actually swim up the falls. The so-called fishladder was dynamited as a passage for drift boats. It is easily passable by large rafts at high and moderate flows. 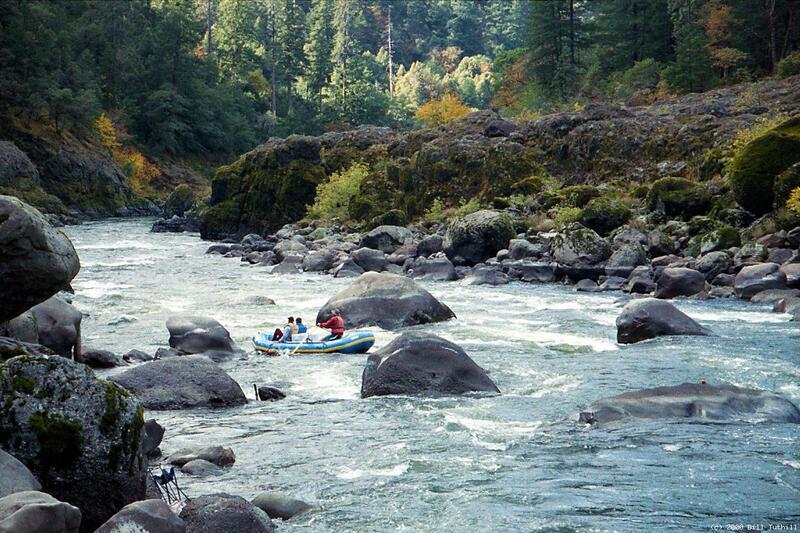 At low flows with oar rafts, you might want to unload passengers at the beach on river left, ferry across to river right, turn your raft backwards, and paddle-guide from the passenger compartment. Remember to pack a paddle. Try to avoid getting stuck sideways. Photos by Larry Hazen and Bart Bartholomew. 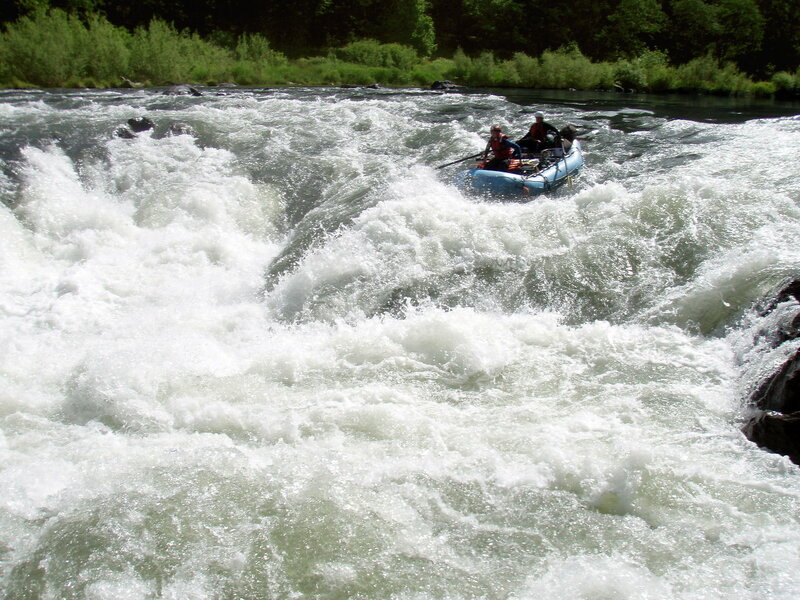 The middle contains a class IV “raft chute” with several steep drops. It can be run by advanced kayakers, but there are some big holes to punch at the bottom. The entrance, disturbingly close to the class V falls, is somewhat hidden and should definitely be scouted your first time. The tricky part is making the precise left turn from the entrance channel into the chute, then stowing or holding onto your oars. 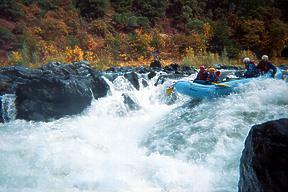 Some rafts get wedged sideways for a while, so please run only one boat at a time. The left side of Rainie Falls is class V, with the principal danger being the recirculating holes on left and right. People have died in Rainie, although perhaps not wearing a modern PFD with wetsuit or drysuit. I have seen several swims after raft or kayak flips, and nobody was injured, although swimmers took a long time to surface. The best route at most flows seems to be over the hump on the right, but not too far right. Forward paddle and lowside prevent a flip Inflatable kayak flips back to front! 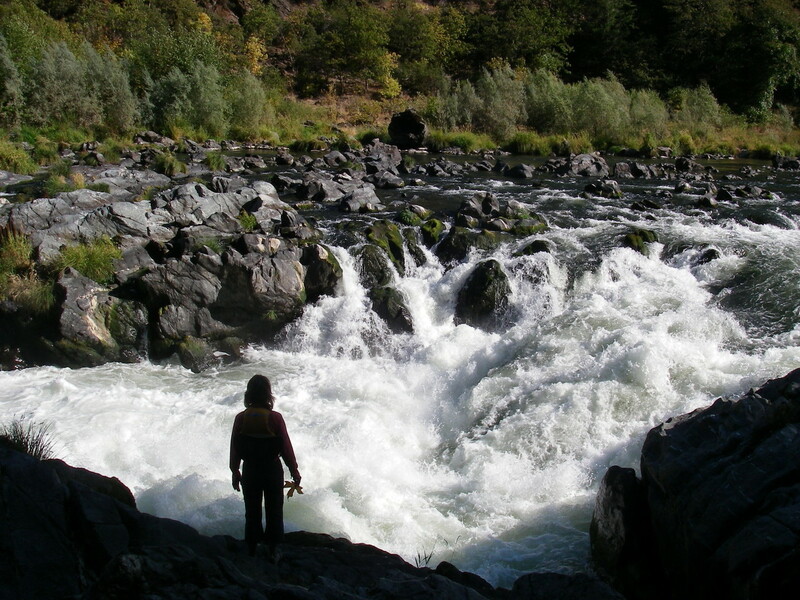 At high flows, such as 3000 cfs in pictures below, waves are bigger but the drop is not as steep, making success a bit easier. Whiskey Creek camps on the right bank. Both are sunny and warm, but the one upstream offers a bit more shade and is closer to the toilet. Historic miner's cabin (with irrigation system) is a short hike uphill. There is small camp on Rum Creek just across the river. Doe Creek camp on the left bank, a huge sandy beach backed by forest. Shortly upstream is a nice camp on a sandy peninsula that is within hiking distance of the toilet. Tyee rapid, class III. The easiest route starts right of center, moves far right, then cuts left along the curving right bank. Tyee camp on the right bank; offers very little shade. Wildcat rapid, long class III. There are many viable routes, although guidebooks usually recommend working to the right of a rocky island. At low flows this is one of the toughest rapids, as sleeper rocks require precise maneuvering. Wildcat camp on the left bank, one of the most beautiful campsites in the west, but without toilet. Slim Pickens rapid, class III. Where an old metal barge is marooned on the left, driftboats must pass to the right of a large rock, although inflatables can run routes in the center as well. Big Windy Creek camp on the left bank, requires you to carry gear up a rocky incline. Even at low flows there is no kitchen area near water level. Beautiful but cold swimming holes in the nearby creek. Upper Black Bar falls, class III+, scout right. This rapid causes a lot of trouble. The easiest route is far right all the way down, possibly cutting one rock left at the bottom. There are some more adventurous class IV routes thru rocks (holes at higher flows) in the center. Lower Black Bar rapid, class III. Big waves at a right turn; stay in the center. Black Bar Lodge on the left bank. Often you see drift boats moored. Reservations required for overnight stay. Road access. Little Windy Creek camp on the left bank. At low flows there is a gravel kitchen area near water level, plus a sandy beach for swimming. The toilet is hidden behind a blackberry patch uphill. Jenny Creek camps on the left bank, upper and lower, gravel slopes above and below the creek, usually not shared. Horseshoe Bend, class III. The river turns right around the beginning of a horseshoe bend, and current forces you into submerged rocks and a cliff on the left. Work right. 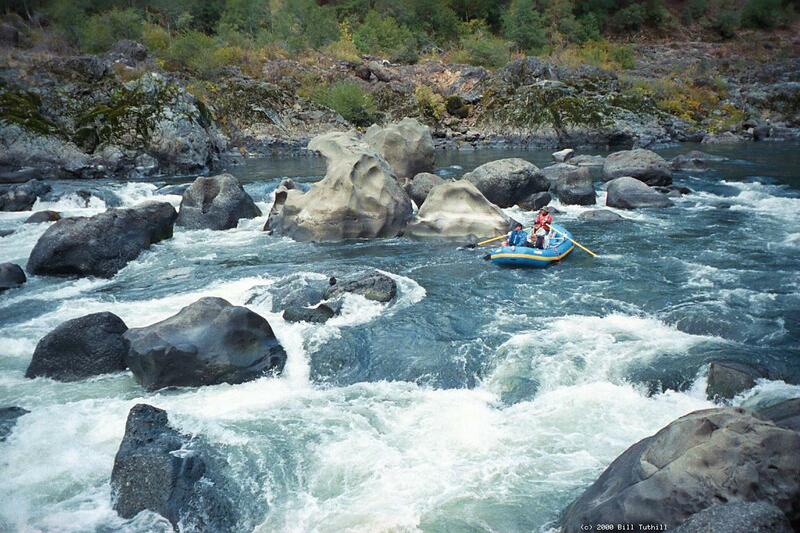 Believe it or not, people have died here, probably because they were not wearing a good PFD. Horseshoe Bend camp on the right bank. At low and moderate flows there is a nice, perpetually shady kitchen area near water level. The large bar above contains several tent sites in the trees, and hundreds more in an open area. Lower Horseshoe Bend camp on the right bank. Supposedly large and with toilet, but I have never noticed it. Meadow Creek (Trail) camp on the right bank, with a small beach, offers little shade, but is nicer than it looks from river level. Battle Bar camp on the left bank, site of an Indian battle. Small kitchen area at river level, with a climb to multiple tent sites. A roof without walls is available for camping during inclement weather. Hewitt Creek camp on the left bank, small shady area near the creek. Winkle Bar, site of Zane Gray's cabin and grass-covered landing strip. Most rafters stop to visit the cabin and see Zane's old driftboat. Missouri Bar camps on the left bank, one upstream and one downstream separated by willows, often shared in summertime. An old cabin can be found a short distance uphill. Long Gulch camp on the left bank, at the mouth of a creek. Mule Creek camps on right bank. 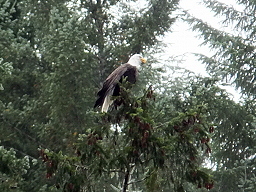 These are usually shared, especially in high season, but arriving first gets you a prime spot. Mule Creek east comes first: a sandy beach with small kitchen area near the water and large kitchen area uphill. Trails lead uphill near some trees, past the outhouse, across a grassy meadow to the historic Wild River Ranch and museum, well worth visiting. Road access. Drinking water is available near the caretaker's cabin. Mule Creek west camps are just downstream: a rock-strean sandy area near the creek, with a huge grass-covered bench (mowed in 2006) and outhouse uphill. 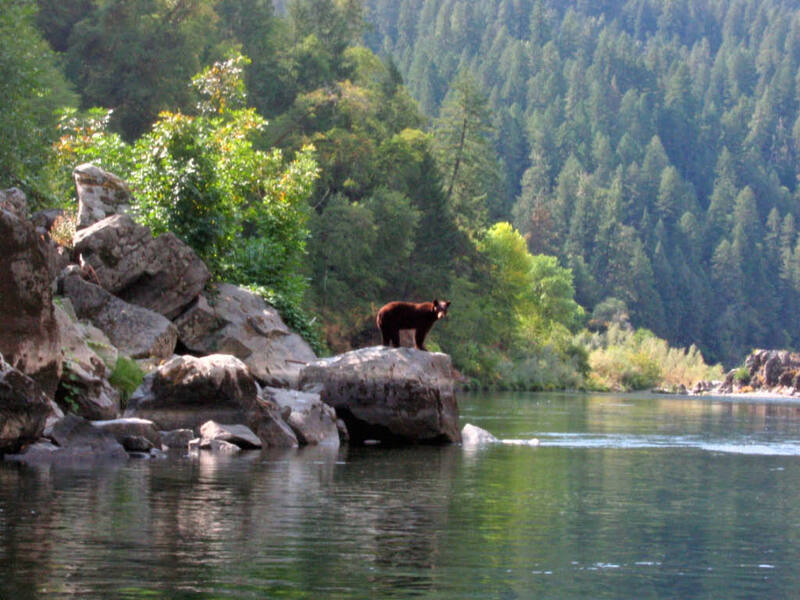 It is possible to camp shortly downstream also, although the sites are not as nice. Marial Lodge on the right bank. Reservations required for overnight stay. Road access back to Wild River Ranch and points north. 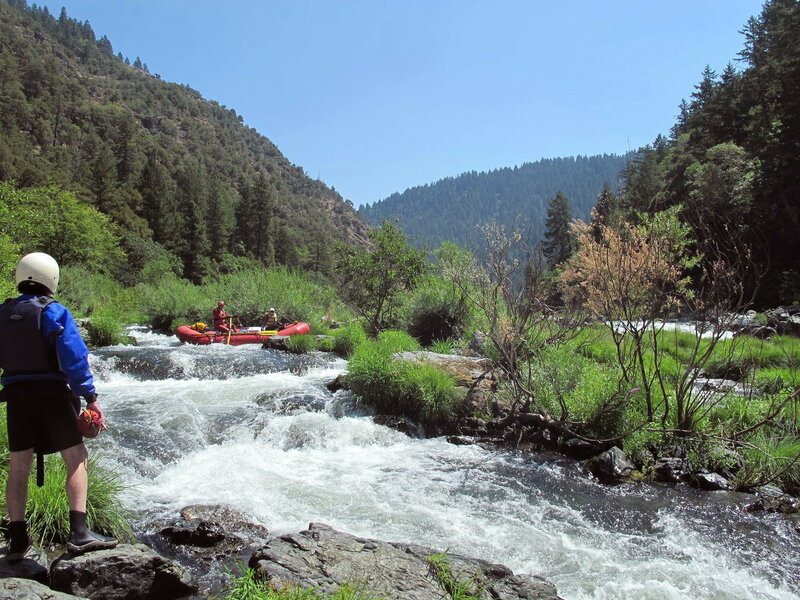 Class II rapids begin above Mule Creek Canyon. Get ready. 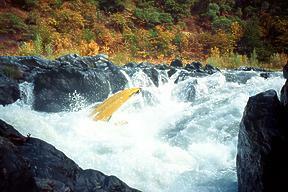 Even though Mule Creek Canyon contains nothing more than class III rapids, a swim could be very long and cold. Jaws, suspenseful entrance to Mule Creek Canyon. 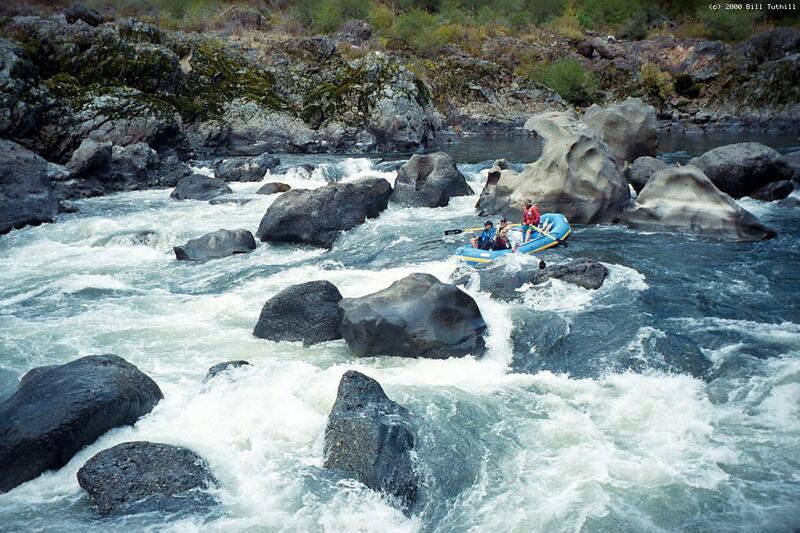 This stretch is quite difficult in small boats because of big swirling whirlpools. Several S-turns follow the entrance. After keeping away from the right wall, stay away from Telfer Rock on the left, where several people have died, none of them wearing PFDs. After the S-turns, the river enters a narrow defile called Coffee Pot, where hydraulics percolate at flows between 1500 and 2500 cfs approximately. Stair Creek comes in on left with a lovely waterfalls, marking the end of turbulence in Mule Creek Canyon. If you find yourself in need while scouting Blossom Bar, there is an outhouse for Burns Creek trail camp, reachable by clambering uphill across a rocky area, then turning right onto the hiking trail. Rich Lawrence makes the crux move at Blossom Bar in a heavily loaded boat! Blossom Bar, class IV, scout right. Some people argue about whether this is really a class IV, because the moves are easy enough, if you make them. Consequences can be severe though, because of the Picket Fence on the left and constricted drops on the right. Scouting from the right doesn't do much good, since the most important move is hidden behind a horn rock. However there is a cliff on the left that precludes scouting from that side. If people want to walk around the main drop, they can rejoin boats at a small gravel beach about halfway down the rapid on the right. Approach on river left, in the middle of the far left channel, avoiding piddler rocks on the right of the channel, because hitting them would mess you up. 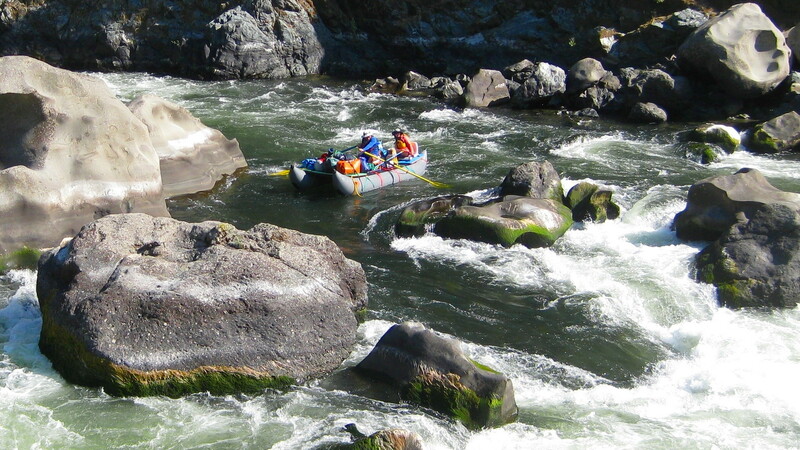 After clearing piddler rocks, ferry right quickly (backferry rafts) into an eddy behind the horn rock. Surprisingly, this eddy exists even at relatively high flows. 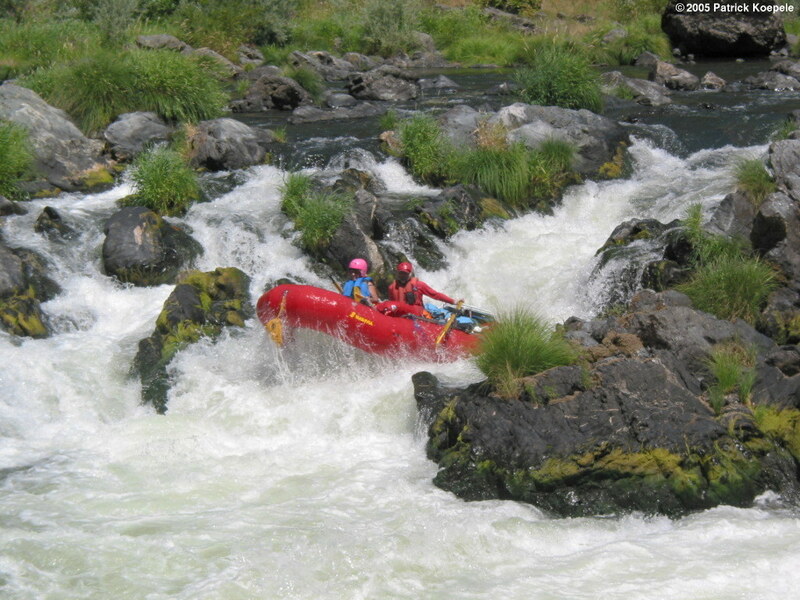 Patiently position your boat into the center of the main drop, down a tongue. Avoid rocks below as necessary (more so at low water). 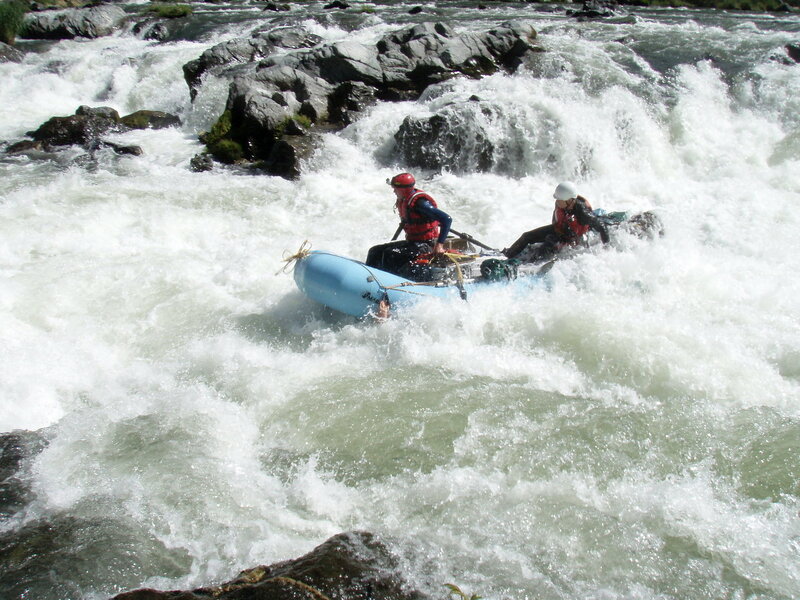 After the horn rock maneuver, the rapid continues for quite a ways. Down below you can work to river left, where there is a wide channel, but many alternate routes are also available at most flows. For another view of Blossom Bar, see the Big Boat Carnage Gallery. Devil's Stairs rapid, class III. Enter in midstream and keep away from the wall and hole on the right. Gleason Bar camp on the left, a beautiful spot with sandy slope leading down to the river. For some reason, few boaters camp here. Paradise Lodge on the right, open year-round. Beer and ice cream available. 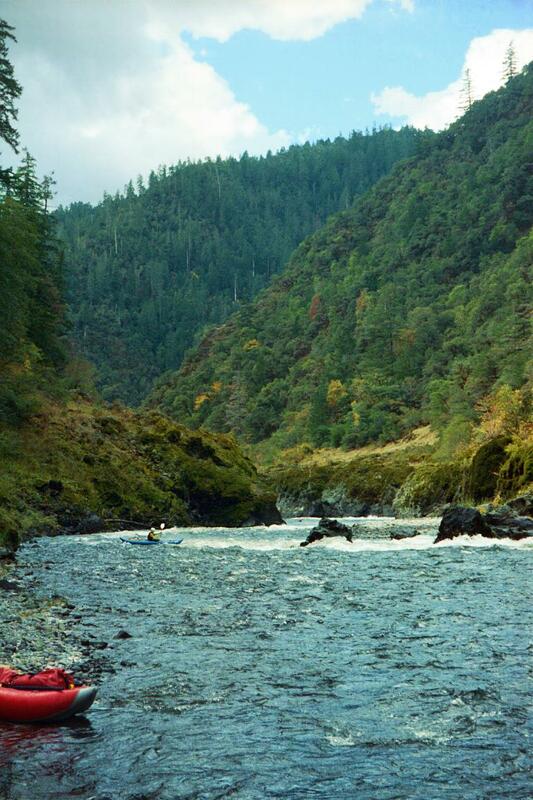 Shortly downstream on the left is Half Moon Bar Lodge, with excellent accommodations. Half Moon Bar camps on the right bank, upper and lower, little shade. Brushy Bar camps on the right bank, upper and lower near the creek. Few boaters camp here, perhaps because flat spots near the river are not very large. Ranger station and outhouse well inland. Upper Solitude camp on the right, with little shade, although tents can be pitched in the woods above. Lower Solitude camp on the right, also with little shade, but highly sought-after due to its beautiful rock formations. Also, the custom is not to share this camp, hence the name. Tate Creek on the right, with a highly unique body-wide water slide about a quarter mile upstream. You can climb to the top using a rope, or hike up and over a cliff on the right (creek left). Tate Creek camps, upper (small) and lower (larger but not huge). Tacoma camps, upper (nice) middle (nicest) and lower (rockier). These are beautiful camps, but almost always shared in high season. Bats come out at dusk and eat mosquitoes that lurk in the woods. Clay Hill Lodge on the right after a class III rapid. Check out the dinosaur-shaped tree! Reservations required for overnight stay. Clay Hill stillwaters for over a mile. Eroded potholes on right, where conglomerate pebbles scour a grinding-hole at high flows. Falls Creek on left, makes an interesting stop so you can observe the semi-hidden waterfalls. Flora Dell Creek on the right. There is a nice small campsite here, supposedly with (downstream?) outhouse, which I have never located. 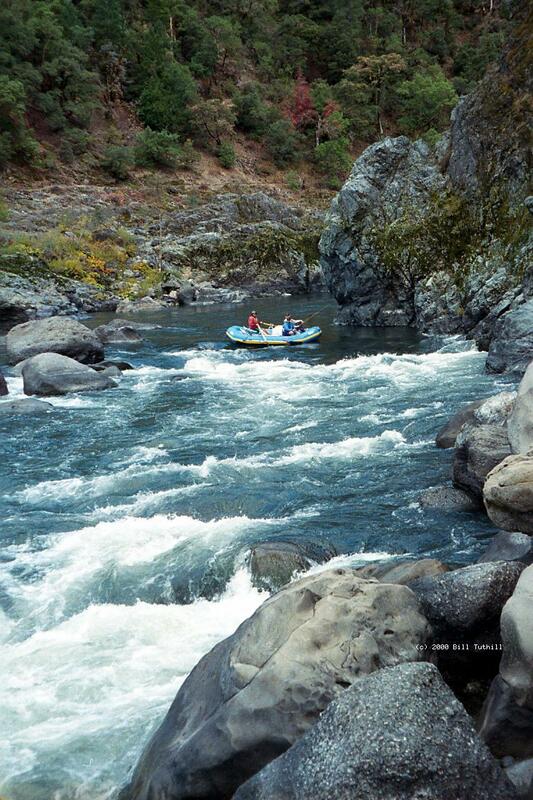 Wild River Lodge on the left after a class II rapid. Reservations required for overnight stay. Shortly downstream, naturally formed paving stones are visible on left bank. Illahe Lodge on the right after Billings Creek. Reservations required for overnight stay. Foster Creek and Foster Bar on right, after class II-III Illahe rapid. This is probably where the shuttle drivers parked your vehicle. To reach put-in, exit I-5 at Merlin (north of Grants Pass) and drive west to Galice Resort, where you can arrange shuttle. The Ranger station where you pick up your permit is a few miles further west. Continue west to Alameda Bar or even further to the parking lot past Graves Creek bridge. Shuttles are also available, and currently less expensive, from Affordable Shuttles and possibly other providers in Grants Pass and Merlin. When you reach Foster Bar, your car should be there. To reach highway 1, you can continue along the Rogue river valley towards Gold Beach on the coast, or return to Galice Resort using back roads. 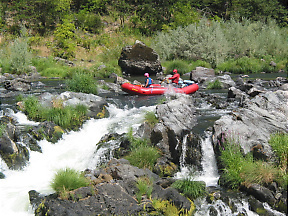 To find nearby food and lodging, type Grants Pass into the box and click Search.